Homeless teens make up 40% of the homeless youth in America. 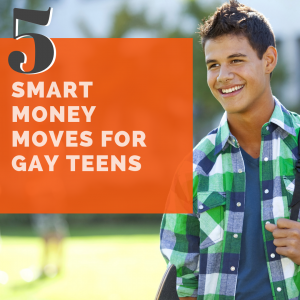 That means our LGBT teens need some serious financial help to be prepared for adulthood. 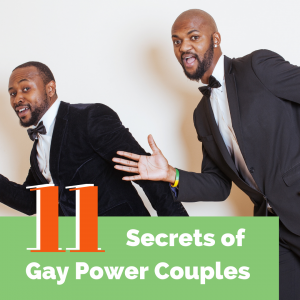 Here are our four best money moves to make when you’re gay and 18. John posted a “Dear John” letter to his 21-year-old self a while back. It was an open letter of what he’d say to himself in his 20s about money, knowing what he knows now. Hindsight is always 20/20, right? So, with our 20/20 hindsight vision, here’s my advice for money moves to make when you’re gay and 18. This made me think of my challenges in my twenties and my struggles with being gay. I was raised a Jehovah Witness (J-dub for short). Everything I heard and read about being gay was bad. This created an internal conflict because I knew as early as nine years old that I was exactly who my minister railed against. I knew what to expect when I told my parents I was gay. I knew they’d kick me out of the house and I’d likely never see them again. My crystal ball didn’t lie. When the day came to tell my family I was gay, not only was I scared to lose them, I was scared of how I would take care of myself physically, emotionally and financially. In a flash, I’d be alone. Being raised to believe that “the church” would take care of me from cradle to grave, I didn’t prepare to be emotionally or financially independent. I could’ve benefited from these smart money moves. Whether we jump out or are pushed out of the nest, many queer kids and young adults find themselves in similar financial situations with similar fears. This made me think of how The Debt Free Guys™ could help queer people in their teens and twenties who face similar situations. Before I start, I want to give you an extra tip. 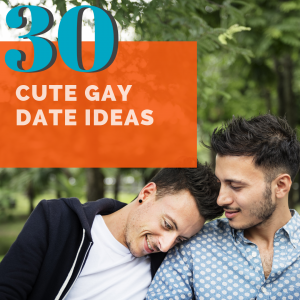 Become a gay blogger! In today’s world, you can make a living by being a gay blogger or expanding your influence in any career because of your gay blog. Whether you blog for money or blog to make the world a better place, you won’t regret starting a blog today. Blogging will give you financial independence and provide our queer community more of a voice. Overcome limiting money beliefs. Many minorities, queer or otherwise, grow up with limiting money beliefs from a lifetime of feeling less than or inadequate. These limiting money beliefs are hard to avoid, but the best money moves to make is to not accept limiting beliefs about yourself, money or what you’re worth. What you believe becomes your reality. Therefore, don’t create a negative reality. You deserve as much success and happiness as anyone. Open a Roth IRA. I spent one summer painting my grandmother’s house when I was a kid. I was paid $1,000. Being naïve, I spent all this money. I wish I would’ve invested it, so I had some security when I was kicked out of the house. Today, I’d open a Roth IRA. A Roth IRA lets you invest earned money in an account that grows tax-free. That means you keep all your investment growth, rather than having to pay taxes. The best way to ensure investment growth is to invest for the long-term. You’re 18 and have time on your side. This means you won’t have to save so much money so soon. Invest just $100 a year. We promise that you won’t miss it. Avoid credit cards. Having a credit card sounds exciting. It’s not! Credit cards and debt are risky. A credit card mistake will screw you out of the houses, cars, and vacations you’ll want. What do we suggest? Cash! If you want to build a credit history, try this trick. One of our nieces FaceTimed with us last weekend to discuss getting a credit card and we gave her this advice, too. She wants to build a credit history, so she can rent an apartment in NYC next year. Our advice, which she’s taken, was to get a gas station credit card to build credit. She has to buy gas anyway and, unless she buys a smorgasbord of qwiki-mart food, she’ll never put more on her gas station credit card than a week’s worth of gas. Track your spending. Start using a money-tracking tool like Honeyfi, which is designed for couples to do better with money, but can be used as an individual as well. Live below your means. Take it from me, if you spend more than you earn, you’ll always be broke. Sports Illustrated reported that 78 percent of NFL players go broke because it’s not how much money you earn, but about how much you save and invest what you earn. Your future seems like a long way off and money feels unimportant, but you’ll save yourself a world of butthurt, especially if you’re at risk of losing your family if you take even half my suggestions. If you accomplish these four steps in the next year, you’ll be light years ahead of me at your age, regardless of whether you’re pushed out of or jump out of the nest. Save this article for later. Click the image below and add it to your favorite Pinterest board. Wow, thank you for sharing. The whole concept of being able to rely on the church and also facing that is fascinating and would also be terrifying to face. Anne, thanks for the comment. It was tough to know I was going to be completely alone. I think that was the reason it took me so long. Better finances would have helped with that decision. David and John, I love the work you’re doing here. The transparency you bring is helping us all feel more comfortable to talk about money, debt, and credit. Keep up the great work! I wish I read this article in my late teens. I never thought about investing for retirement when I was young. I lost money by not investing early. I also missed out on free money by not taking advantage of company matching on my 401(k) contributions. I also got taken advantage of with my first credit card. The health club sales guy put two years of my gym membership on my credit card (when I thought I was just getting a $20 monthly payment sent there). I should have read the contract more carefully. Thank you for the vote of confidence Mike. We appreciate your support. It does sound like you were taken advantage of, just another reason why we need to educate the youth of today about the pitfalls of credit and help them get on a stronger path financially. Thanks for sharing your story. It’s a personal finance dilemma that’s not often talked about. I can only imagine how terrifying it would be to lose my support system overnight. Like Mike, I wish I had saved more at a younger age, but my saving grace was my boss at my first job who insisted I put money into the company retirement plan. I like the advice about getting a card with a small limit so you can still build credit but avoid temptation. Thank you for the nice words Gerri. We hope that things have changed for many gay youth, but I also know there are many out there today that still need to be determined on their own. We hope that making better financial decisions can make that a bit easier. It is true that credit cards can be a temptation especially when young and our you own. Keeping a low balance minimal use card helps to avoid the temptation. It’s nice that your brother has somewhat of a support system. Things have changed quite quickly, but there are still many out there that have no support system and we hope that we can inspire them a bit to think ahead. It may not be top of mind, but I know for myself, it would have been a bit easier if I knew I could support myself and had the confidence to do so. Yes, Mindy. I grew up a J-Dub. I learned some solid principles, but I really enjoy who I am now. I think part of that has to do with living a life of abundance and not worrying that the end is neigh.